The galaxies NGC 2336 and NGC 2937 look like a penguin and its egg, respectively, in this photo, which incorporates data from NASA's Hubble and Spitzer space telescopes. Fans of the Horsehead and Crab nebulas, take note: There's another giant galactic animal on the scene. 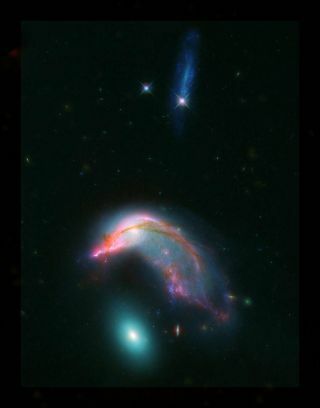 Two interacting galaxies about 23 million light-years from Earth look just like a penguin and its treasured egg in a spectacular new image that combines data from NASA's Hubble and Spitzer space telescopes. "Rich with newly formed hot stars, seen in visible light from Hubble as bluish filaments, its shape has now been twisted and distorted as it responds to the gravitational tugs of its neighbor," the officials wrote today (Feb. 1) in a description of the newly released photo. "Strands of gas mixed with dust stand out as red filaments detected at longer wavelengths of infrared light seen by Spitzer." That neighbor is the "egg," a galaxy known as NGC 2937. There's no discernible star formation going on in NGC 2937, whose uniform greenish glow is produced by relatively old stars, NASA officials said. Eventually, the penguin and the egg will join to form a single galaxy. Such mergers are common and important steps in the evolution of large galaxies. Our own Milky Way, for example, will merge with the neighboring Andromeda galaxy in a few billion years, scientists say.